You haven’t watched an Asian pop concert until you watch ARASHI’s concerts. Their concerts are more than just song and dance. They are an experience. * Just a note on the part about the technology used in ARASHI’s 2012 Kouhaku performance. It’s called “real-time AR (augmented reality)” and the sensors were in the members’ hands. More explanation on what AR is here. But that’s par for the course in an ARASHI performance, be it on TV or in a concert. They are always innovating with different forms of technology to enhance their performance (sounds like some lethal drugs, but they are that figuratively). And yeah, roll your eyes sweetie because that’s the truth. With each concert that they produce, they always raise the bar from their ARASHI AROUND ASIA in 2007, when they performed for the first time at Tokyo Dome and Kokuritsu (Japan’s National Olympic Stadium); TIME in the same year; DREAM ‘A’ LIVE in 2008; ANNIVERSARY TOUR 5×10 in 2009 when they made their entrance suspended up in the air across Kokuritsu; SCENE in 2010; BEAUTIFUL WORLD in 2011, and this year, ARAFES and POPCORN, where the water screen made its debut. 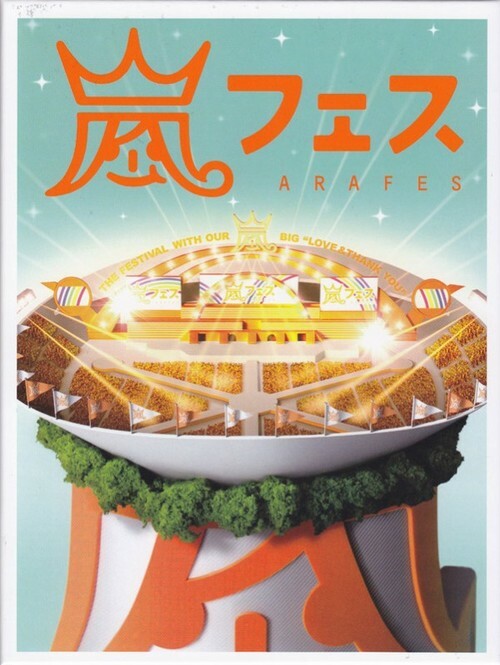 With the release of ARAFES DVD, ARASHI made history by selling 7 million DVDs. Their DVDs may cost a fortune at almost US$70 (don’t even get me started on how much a ticket to their concert can cost through auction) but it’s money well spent. Oh and one other important thing that strikes me about their concerts: these boys are not like robots. They may not be the best dancers nor best singers in the entertainment pop scene but they have a lot of heart. And that is very obvious in the way they interact with their audience. They don’t preen and strut like idols as if they were on a catwalk. They work hard at building rapport with the audience by communicating in the best way they know how. Of course credit does not go to ARASHI alone for producing such concerts, and they are always the first ones to acknowledge the people behind them: the hundreds of crew and staff who help them plan each concert, build the stage, produce those amazing videos, operate the lights and pyrotechnics, the live band and orchestra, dancers… they all contribute to what makes an ARASHI concert awesome. Yes, even their designers who make them wear those kira-kira costumes, but hey, it works. Imagine if they’d be wearing dull costumes in a humongous place such as Kokuritsu, they will be drowned by the sheer size of the place. I wish they would do another ARASHI AROUND ASIA tour. But Johnny-san is a savvy businessman and an AAA may be both bad news and good news if it happens. Bad in the sense that it may mean the jimusho no longer sees them as profitable in Japan that’s why it’s time for them look outside; but good for us overseas fans. What a dilemma. Another thing is the lack of suitable venues in the region where they could hold concerts like the ones in Kokuritsu (their concerts have become a matsuri/summer festival in Tokyo). Sorry, a mall where other pop stars hold their fan meetings won’t suffice. Besides, fan meetings are so different from concerts, especially ARASHI concerts. They need space, and lots of it for how to accommodate the iconic moving stage? The effects? And how to appreciate Sho flying on a harness nevermind the scared brave look on his face? But it’s possible. They did it in Taipei and Shanghai (despite the logistics and other problems encountered with the government). There are some cities in Asia where they can bring their concerts to like Hong Kong and Singapore. But for now, overseas fans like me have to be contented with their DVDs. Imagine that’s how it’s like watching the DVD. How much more when it’s live. I watched them live once at the Asia Song Festival in Gwangju, South Korea, in 2006 and my dream is to watch them live in a full concert. Just like how fans who have watched them live also describe the experience. Like a dream. Photos from the Arashi community on tumblr. Thank you for writing about Arashi concerts! Reading your entry makes me even prouder to be an Arashi fan. I share your dream (as a gazillion of other fans do) of watching them perform live in a concert. Hope we can be part of that dream-like world real soon! are you talking about the Subarashiki Sekai unplugged version? I love it when they do unplugged or orchestra. just beautiful.